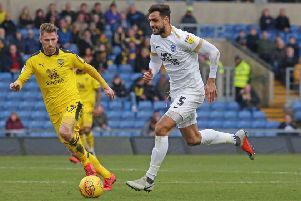 Posh defender Michael Smith has been included in the Northern Ireland squad for a World Cup qualifier against the Czech Republic in Prague on September 4. Smith (27) Smith received his first call-up to the senior Northern Ireland squad on March 16 2016 for friendlies against Wales and Slovenia. Noirthern Ireland squad: McGovern (Norwich), Mannus (St Johnstone), Carson (Hartlepool), McAuley (West Brom), J Evans (West Brom), Cathcart (Watford), McLaughlin (Fleetwood), Hodson (Rangers), Smith (Peterborough), Flanagan (Burton), Davis (Southampton), McGinn (Aberdeen), Norwood (Brighton), C Evans (Blackburn), Ward (Nottingham Forest), Ferguson (Millwall), Dallas (Leeds), McNair (Sunderland), Duffy (Dundee), Lafferty (Norwich), Magennis (Charlton), Washington (QPR), Boyce (Ross County).